Kevin Cyr was born in Edmundston, NB, Canada in 1976 and grew up in the small paper mill town of Madawaska, Maine. He received his BFA from Massachusetts College of Art in Boston. For the past decade, Kevin’s work has been focused on talking about “place” through vehicles he has encountered on the streets where he’s lived as well as places he has traveled to. While the car remains an iconic status symbol in contemporary culture, he finds beauty and character in old unkempt vehicles, particularly those associated with working-class society. 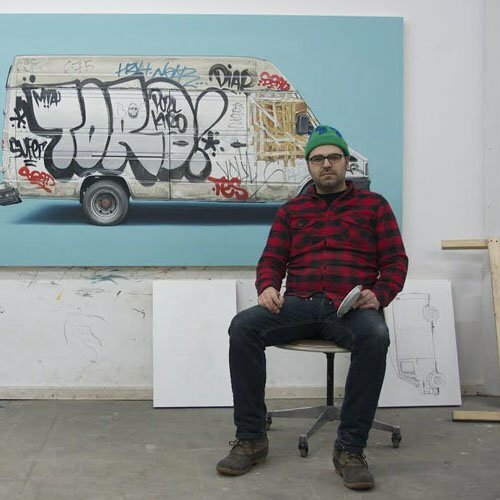 He has created a large body of work focused on panel vans in NYC as well as graffiti covered European trucks. He has also created large scale sculptures inspired by bike and camping culture that explore themes of autonomy, shelter and mobility. "I found myself really absorbed looking at Pat Perry’s drawings and paintings. He has a style that looks effortless despite having fairly complex compositions. There’s an intensity in his sketchbook drawings that I found really compelling. It’s really amazing to see how he’s documented his travels and how he uses his experiences to inform his work. I imagine him as the type of artist who has an uncontrollable compulsion to create; someone who’s constantly processing the world around him through his work. And, he’s probably got some pretty crazy travel stories." 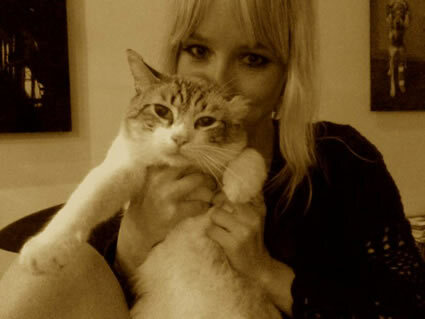 "I love portraiture so it’s really exciting when I find an artist who does it really well, especially self-portraits. 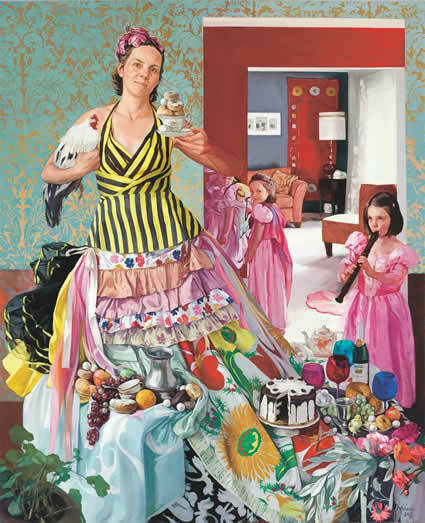 Haley Hasler creates amazing paintings with herself as the focal point and her family as supporting cast. Each painting is stunningly complex and so well executed. Her ability to create so many intricate narratives, without ever feeling monotonous, is impressive." "Julien Mauve’s series of photos titled “After Lights Out” is so intriguing in its quietness and solitude. This series has tremendous depth despite being mostly monochromatic. In these serene scenes, a stillness is punctuated by a single light, transforming landscapes into inquisitive narratives." "The monumental scale of Hendrik Beikirch’s portraits are extremely impressive. That’s not to take away from the simple beauty of his portraits though. He has a great drawing style that enables him to really capture the essence of his subjects, seemingly anonymous old men with weathered faces. At first glance it would seem he’s using graphite or charcoal, but it’s a mix of mediums like acrylic, ink and spray paint. I hope to see one of his enormous portraits someday. It would certainly be impressive to look up at a 50 foot high portrait." "Emiliano Granado’s “At the Track” series intrigued me for its subject matter: blue collar and car culture. He was able to take a very ordinary subject matter and make stunning photos. He’s done the same with his other projects. Emiliano’s statement of being a cultural tourist and studying subcultures really resonates with me and I can find some truth in that sentiment in my own work."